The East bank of Luxor ( Karnak and Luxor temples). Would you like to see the largest compound in the world ? I'd highly recommend Melad and his driver Remon. Remon picked us up on time from Marsa Alam and drive us safely to Luxor to meet Melad - a 5.5hr journey. It did not feel that long as we enjoyed the ride and took some rests. Upon arrival, we head out to Karnak temple and Luxor temple in the evening to enjoy the evening scene with lights. It was well planned timing and Melad's knowledge of the temples and Egypt history were impressive. My family with two girls aged 13 and 11 throughly enjoyed the tour! Very knowledgeable, enthusiastic guy with a „can do"-atmosphere. Adopts easily do individual needs. I certainly can recommend him for a tour in Luxor. Showed up punctually and the minibus was very comfortable. TOUR GUIDE RESPONSE: Thank you so much for your great review and your kind words about me. My best regards to you and your family. Melad is a wonderful guide. Our flight was delayed and he made excellent accommodations to our schedule, making sure we fit everything in. He is very knowledgable and personable. Highly recommend this tour. Our first taste of Luxor and could not be more than satisfied. Highly recommend and our tour guide was so informative. TOUR GUIDE RESPONSE: Thank you so much for your kind words dear Julie and Jim . Melad was great. He pulled strings to pick us up in Safaga at the side of the cruise ship, which was no small feat. He was very, very knowledgeable in the realm of Egyptology. I couldn't have imagined being able to appreciate all the things in Luxor we saw without his input. He was also very flexible and accommodating. My father uses a wheelchair and Melad had many good ideas to help my father see and enjoy as much as possible. 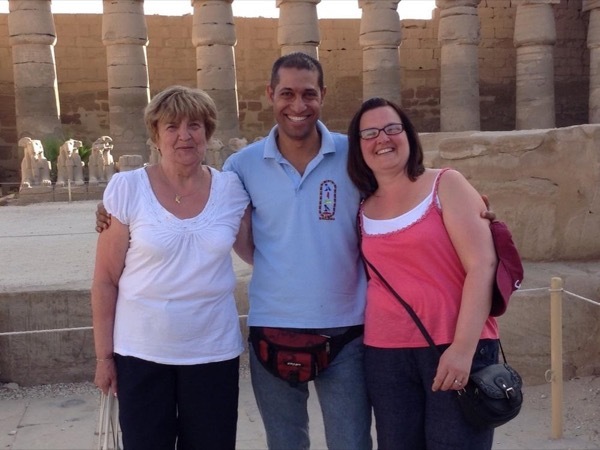 TOUR GUIDE RESPONSE: Thank you so much for your kind words , It was my pleasure to be your guide in Luxor, I am glad that you enjoyed your visit to Luxor with me and I really enjoyed your company and your family too.I look forward to seeing you again in Luxor. My regards to you and your family. Combined with hot air balloon ride. Melad met us at the agreed point in cooperation with the operators of the balloon. He had selected very good representations of popular tombs and temples of kings and queens as well as lesser known tombs of the nobles. Excellent historical knowledge, making the day truly memorable. Great tour of Karnak and Luxor temples and museum. Melad took us through all the main sights, with interesting and detailed explanations. After a late lunch of really good Egyptian food, we had time to go back to Karnak, which is huge, and take in all the secondary sights, too. We had time for a bit of souvenir shopping also. We met Melad for a fantastic dinner, where we enjoyed more of our favorite Egyptian foods. TOUR GUIDE RESPONSE: Thank you for the special time you and your family have given to me. I really look forward to meeting you in Egypt again. Melad showed us features which no ordinary tourist would understand or perhaps even notice. This enhanced the experience immeasurably. TOUR GUIDE RESPONSE: Thank you so much Dr McConaghy . I am glad that you enjoyed your tours with me in Luxor. Gave excellent explanations and descriptions - knows his subjects and well-prepared and tight on schedules - as good as a university lecturer. Anything beyond specifics in tours are triple to quadrupled priced; cheaper to use hotel's service, ie. Sight & Sound show, felucca ride, transportations, etc. Was hoping to have better access to transportations and local eateries (w/o exhorbitant prices). TOUR GUIDE RESPONSE: Hi and happy new year.Thank you for your kind review.I am pleased that you enjoyed my professionalism, Egypt and its history are my passion.There seems to be some confusion regarding the "extras" , i did not arrange any of these for you, the prices i charge are the ones that are on my website. We had an enjoyable lunch on the West bank at a restaurant of my choice, this is because I trust the food is of a good standard. I can assure you that the hotels charge a far higher fee than local Guides/taxis etc. TOURSBYLOCALS RESPONSE: This is uncharacteristic of the excellent feedback we've come to expect of Melad's customers. We advise all travelers to request any changes to an itinerary in advance. Some changes can be made easily, but others may carry costs or conflict with a tour itinerary. Vehicles used for a tour are typically not available for use beyond the tour itself. The tour round Karnak and Luxor temple were amazing and Melad's knowledge on ancient Egypt really brought everything to life for us. Melad has an indepth knowledge of the history and heiroglyphics but is careful not to overwhelm, building on the stories and injecting humour. This meant that we were able to walk around, reflect and realise we were recognising characters in the paintings and engravings! A brilliant trip, thanks Melad. TOUR GUIDE RESPONSE: Thank you very much for your kind words. I really didn't do more than my duty. you were so wonderful couple and i'm pleased you enjoyed your tour with me. We hired Melad to guide us and it turned out to be one of the best decisions I made! I was travelling with my 2 teenage daughters so safety was a major concern for me and having Melad around made us feel very secure. His advice was invaluable and his knowledge of all the sights was exceptional. The sights were fascinating and we all learnt so much, but a no point did we feel he was lecturing us. He also organised a driver for us who was very friendly and the van comfortable, modern and air conditioned. TOUR GUIDE RESPONSE: Thank you very much for kind words. Actually i did not do more than my job and duty towards you and your family. Please send my warm regards to all the family. Great tour of the beautiful temples of Karnak and Luxor, Melad gave us just enough information and pointed out lots of little hidden gems that other groups just seemed to walk right past. Thoroughly recommended. TOUR GUIDE RESPONSE: Thank you dear Rita for your wonderful comments, that's really so lovely. Great Day. Melad was fantastic. We had some flight changes which altered our time in Luxor. Melad most graciously rearranged the three tour days we had scheduled with him. He was prompt, through, knowledgeable, accommodating. He went the extra mile. He was engaging to our three young children and was sensitive to their needs. We saw a lot yet did not feel rushed. Took us to a great restaurant with a great view. TOUR GUIDE RESPONSE: Thank you Mrs. and Mr. Hancock for your comments, it was really nice to me to be your guide too, and i enjoyed your company too. I hope the kids enjoyed the tours as well.send my regards to them and especially to the very little cute Stella! Thank-you Melad for everything!!!! It was great having you as our tour guide. Your knowledge about Egypt and its history was very informative and we all had heaps of fun along the way!!! We definitely recommend Melad as a tour guide....you won't be disappointed! Thanks again and we hope to see you again when we come back! The tour was excellent and delivered everything that was advertised on the website. Melad's passion and knowledge of Egyptian history made the trip even more enjoyable. Would highly recommend. TOUR GUIDE RESPONSE: Thanks Mr.Gary, It was my pleasure to show you around and to explore the secrets of the Egyptian civilization in Luxor together. I also enjoyed your company. i look forward to seeing you and your family again. We booked Melad for 3 tours, of which this was the first. Karnak was unforgettable and Melad made the day most enjoyable and informative. He speaks fluent English and has a great sense of humour. His pride and interest in his subject comes across and is infectious. Highly recommended! TOUR GUIDE RESPONSE: It is really nice to hear from you again, and thanks a lot for that wonderful feedback,It was really my pleasure to be your personal guide in Luxor.I Look forward to seeing you again. Karnak was truly an amazing sight. Melad artfully explained the stories of each part of the temple, bringing to life an otherwise lifeless carving on stone. The kids (11 and 16) easily took to understanding the history and significance of the site, and by the time we finished with the Luxor Temple, they had a great appreciation of the intermingling of the various religions and cultures - all in one place. And of course, Melad knew just where to end the day with a great dinner. TOUR GUIDE RESPONSE: Thank you very much Mr. Joon, I'm glad that you had enjoyed your tour with me and I really enjoyed my time with your wonderful family . please send my regards to the kids. A history packed tour can become very dry (not just in Egypt :-) but Melad was great add describing and explaining the history and details of Luxor and Karnak temples with enthusiasm that swept up our son in what could otherwise be a long and tedious day for him. We'd also tried a group tour, and we would subsequently recommend use of Melad as a personal guide in preference. We didn't feel rushed and Melad will give you time to explore the sites at your own pace after an accompanied reconnaissance. TOUR GUIDE RESPONSE: Thanks Mr. Philip, Your previous readings before coming to Egypt saved to me so much time and helped me to have the opportunity to tell you some of the ancient Egyptian Mythology.